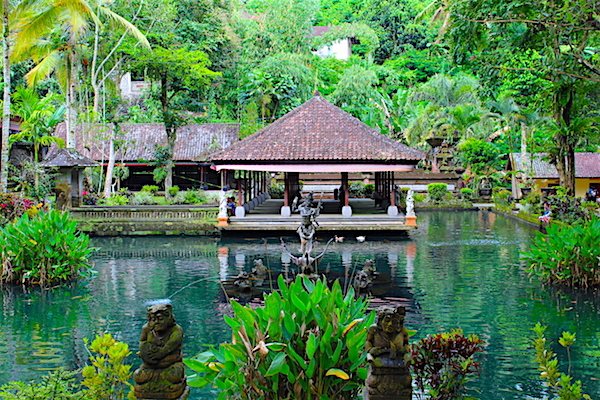 I fell in love with this little village tucked away in the thick, lush Balinese rainforests immediately. 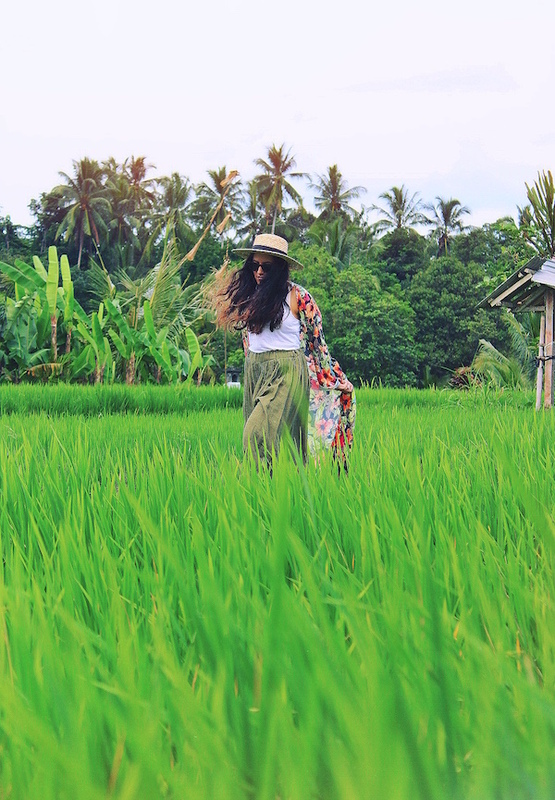 After reading so much about the charm of Ubud, the temples, rice fields, happy locals and amazing food culture, I now knew what everyone meant, and why so many people from all over the world have planted their roots in this creative town. 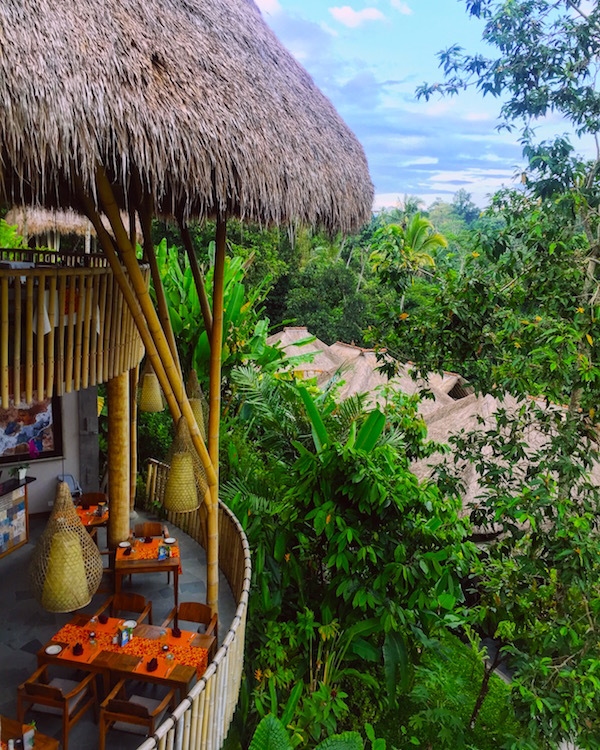 If nature mixed with immaculate Balinese architecture and a gloriously local vibe despite tourism & a large expat community sounds good to you, then you cannot miss Ubud when you’re in Indonesia. 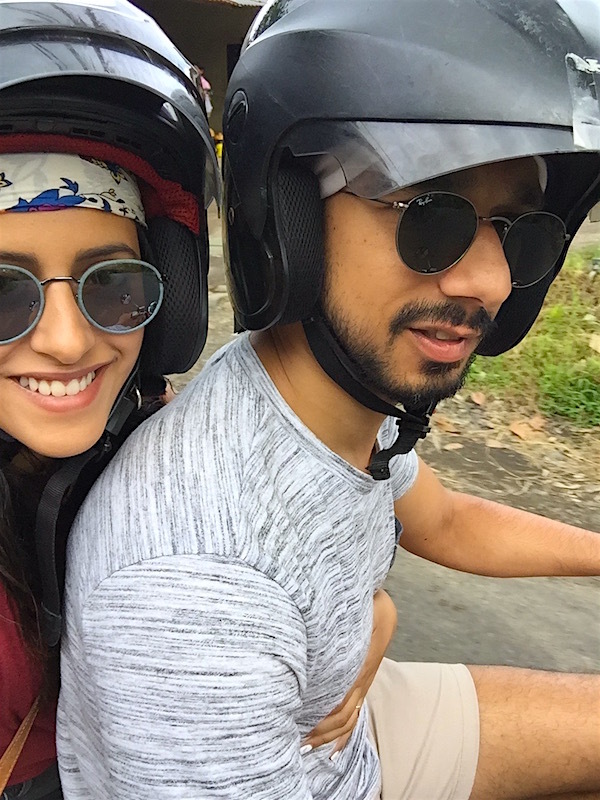 I’ve written a brief travel guide for things you have to tick off your list while here. 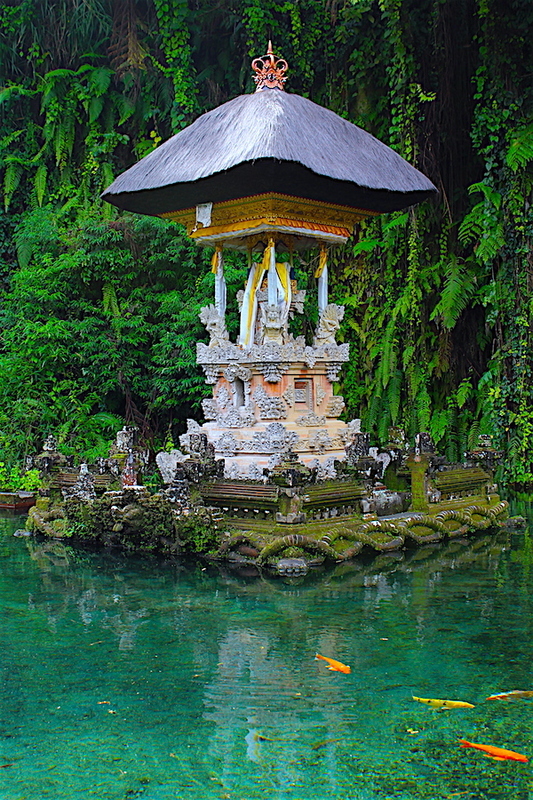 Bali is rightfully referred to as “the island of the gods”. It’s the most popular tourist island in Indonesia, with the southern areas such as Kuta being the most densely packed full of tourists, and the rest of the island getting some relief. 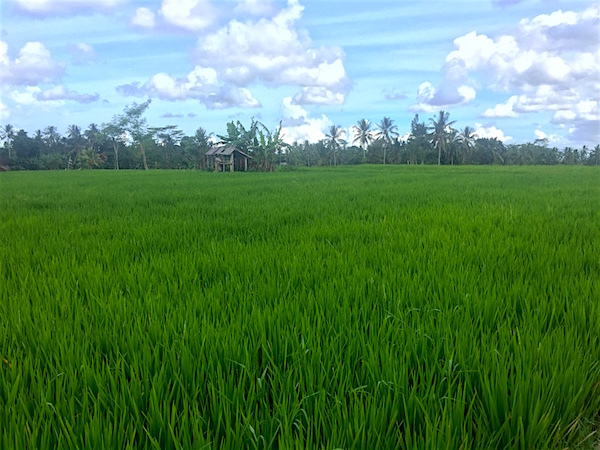 Most of Bali still feels incredibly genuine and untouched. The island is absolutely drenched in streams, rivers, rock pools & waterfalls (yes you read correctly), so it really gives you the feeling of being in a lush tropical destination. The people are friendly and warm, they all want to know where you’ve come from and how long you plan on staying, if you’re married or not and what you do for a living. 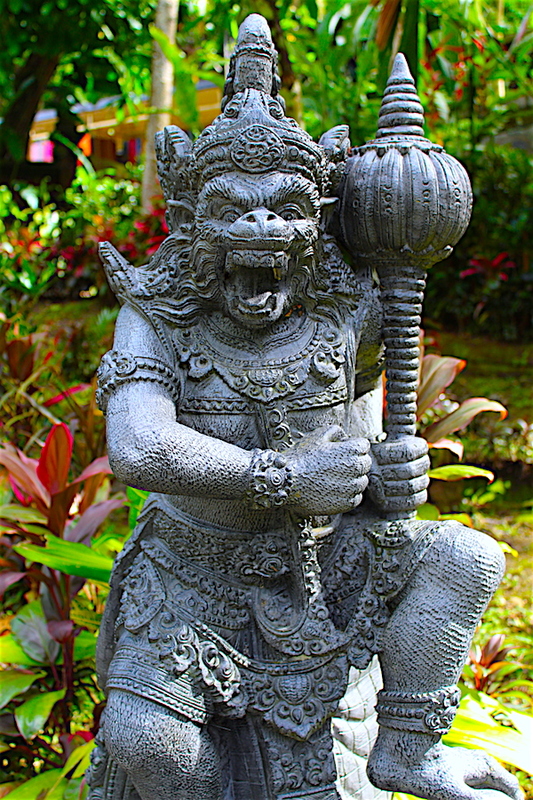 The Balinese believe strongly in karma, so their actions are rarely violent or vengeful. They all pray several times a day and keep offerings of flowers, rice and incense in front of their businesses and homes every evening. The atmosphere here is just pure bliss. 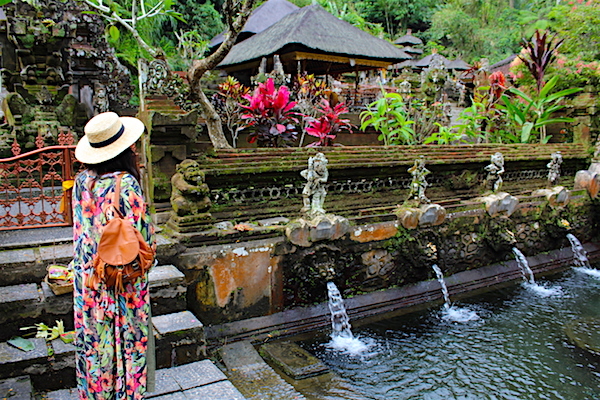 Here are my top 11 things to do in beautiful Ubud! I know safety wise this can be a bit sketchy, but ride super slow, wear helmets and enjoy the view! 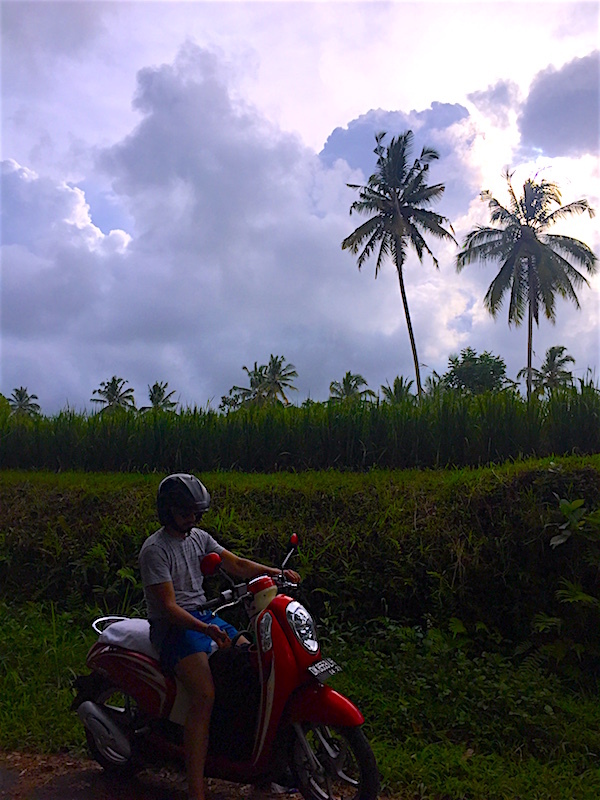 This is the best way to get around the tiny streets of Ubud and you get to see everything up close and feel that fresh, green air in your face. Cabs are pretty expensive even for short rides, and walking is not always possible if you want to see things that are over 20 minutes away by car. It is a spread out town, and you should make it a point to see all of it, up past Tegalallang etc. I think we paid about $8 a day for the bike plus a few dollars for fuel, great value for money and your own set of wheels to explore! 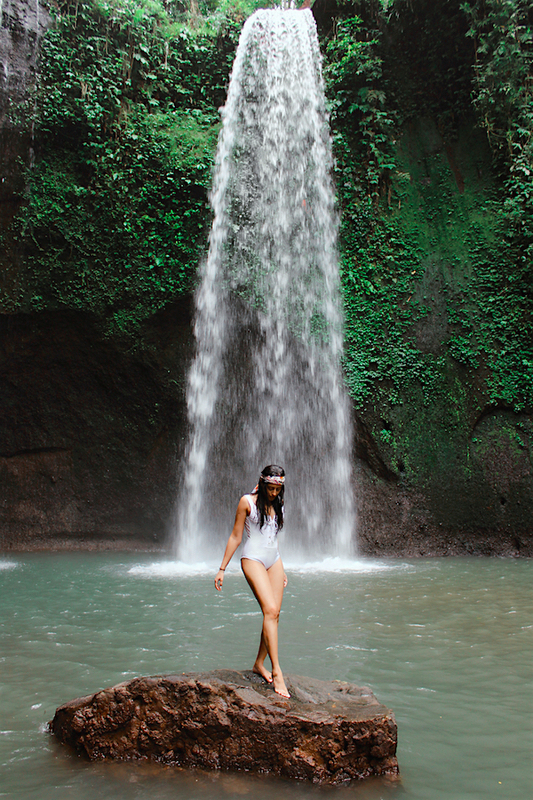 There are SO many waterfalls on Bali it’s almost ridiculous. Waterfalls in all shapes and sizes, for beginner trekkers to advanced hikers, tall waterfalls and short waterfalls and natural jungle slides and shallow streams for a cooling dip. So much beauty just waiting to be discovered. 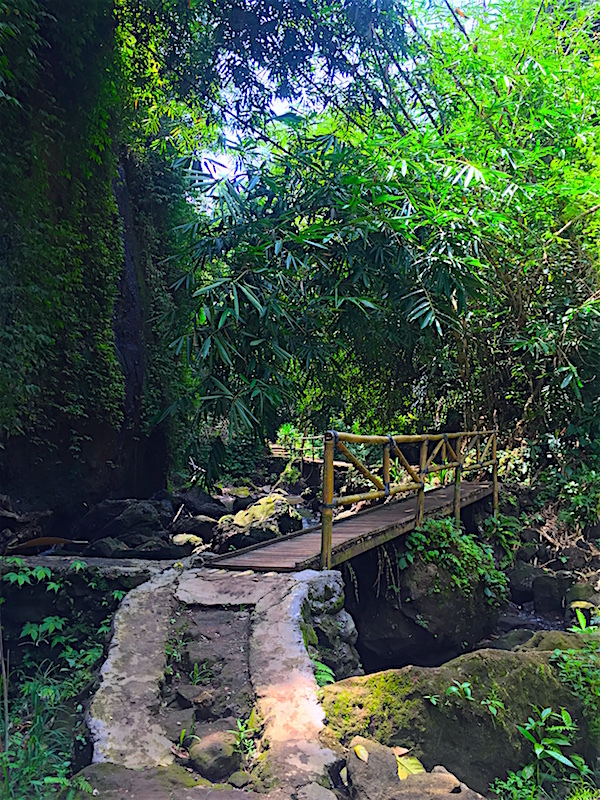 I’m going to do a post soon about 3 waterfalls you can visit from Ubud, so stay tuned for that! Try to avoid the super touristy ones as they will always be packed. Pick one thats slightly off the beaten path, and you may luck out and have it all to yourselves. Pack some beers, water and a light snack for your own forest picnic. The pictures below are of Tibumana Waterfall (we visited a few others as well) which was breathtaking. Balinese temples are usually Hindu, mimicking the very same gods we see back in India but with a Southeast Asian look. Be respectful when you go inside any holy place, women should have their knees and shoulders covered and men should wear pants and something that covers the arms (no singlets/wife beaters). Some of the more famous ones in Ubud include Goa Gajah, Pura Gunung Lebah (in Ubud centre), and my favourite Pura Gunung Kawi Sebatu, pictured below. Some of these date back to the 9th and 10th century, and are truly serene places to visit. Obviously the Balinese massage has become world famous, but for the real experience you have to find a great spa on the island and settle in for the day. 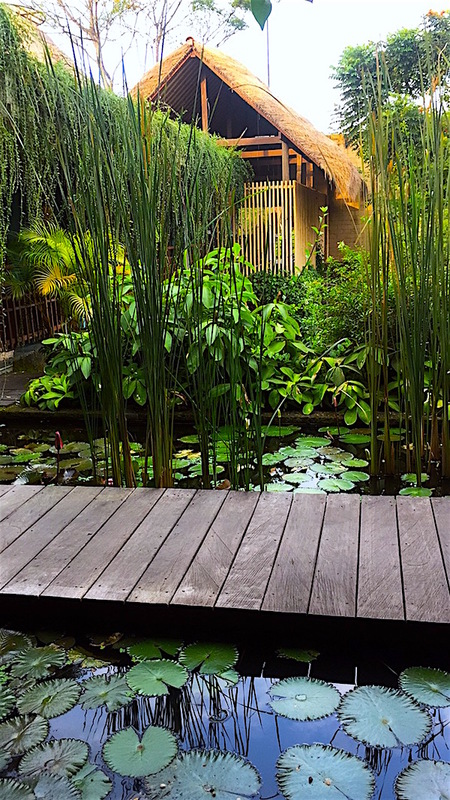 Ubud has some of the best spas in Bali, and not all of them are expensive either. 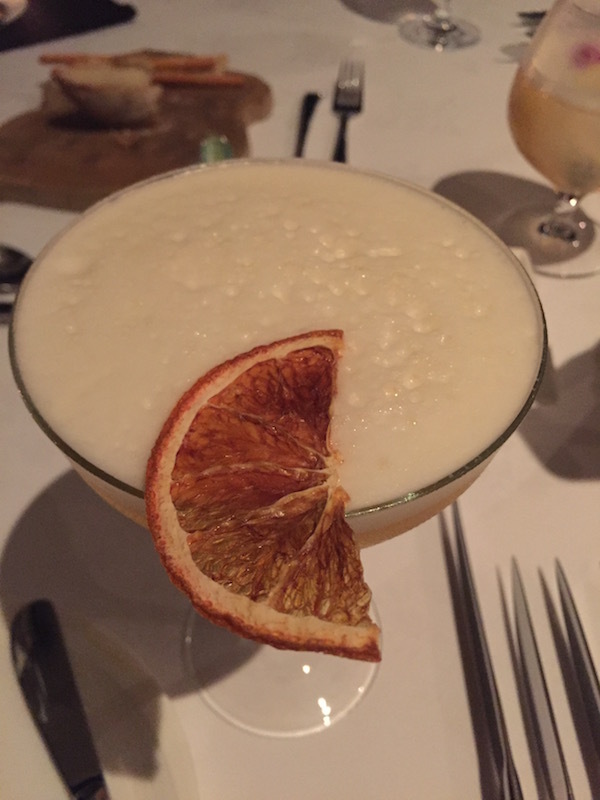 Read reviews before booking or go with a recommendation. 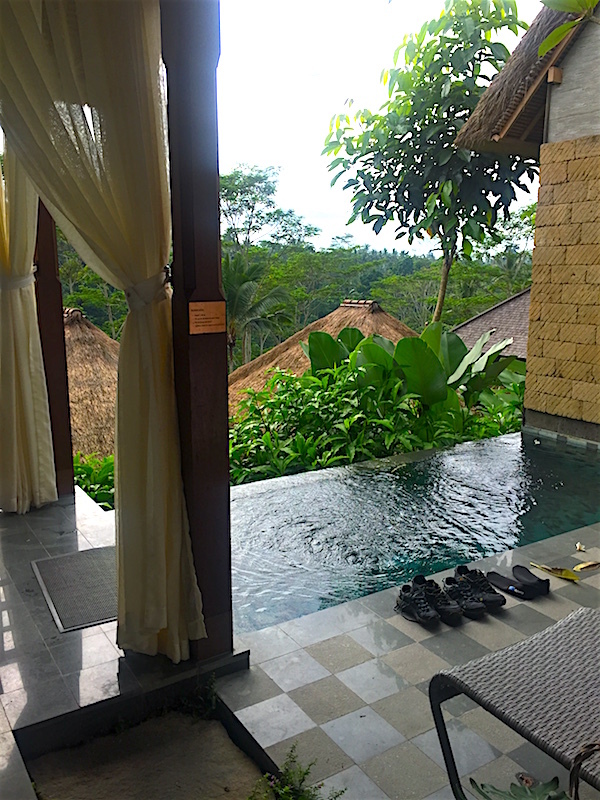 We went to Spa at Maya Ubud, a gorgeous sprawling resort with one of the best spas I’ve ever been to. 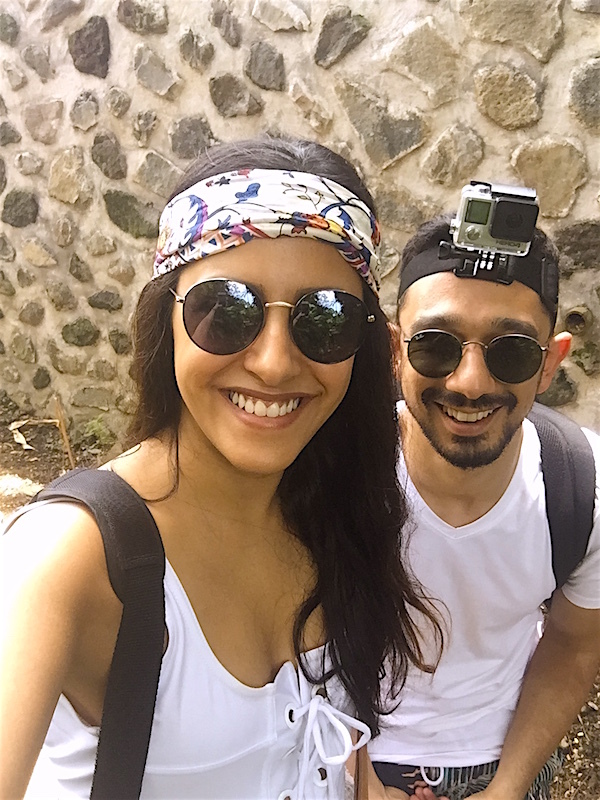 We booked a couples treatment room, which was open to the forest outside and the river gushing in the valley below, and made for a breathtaking experience. 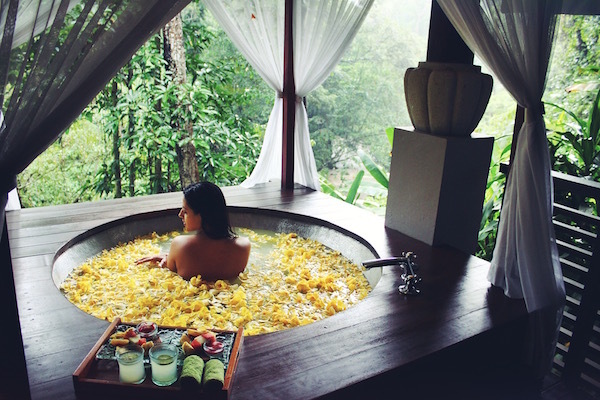 The treatment included a 90 minute massage, a 30 minute scrub and 30 minutes for a milk bath soak at the end plus an outdoor shower and a snack of fresh fruit, yogurt and tea at the end. They let us smell and choose from all the delicious oils, scrubs and soaks to customise the treatment for each person. It started pouring and thundering during our massage, and this only added to the magic. If you want to shop cool, one-off pieces then you need to stroll through the entire main market and side streets. They are dotted with eclectic boutiques, boho designs, hand-dyed fabrics and batik prints, organic and eco-friendly skincare, cane bags, little cafes behind ornate carved doors and some amazing food. Hands down one of the best meals we had on the island, these curry noodles (or you can get curry rice) still haunt my dreams. Flavourful, spicy broth with veggies and pork/chicken on top of deliciously silky smooth noodles and you have a winner. This warung (a local style eatery) is small and almost always full so make reservations ahead of time, especially for dinner. Warungs are a great way to eat lip-smacking local food at incredibly cheap prices, and often times the food will be far better than the more expensive restaurants. 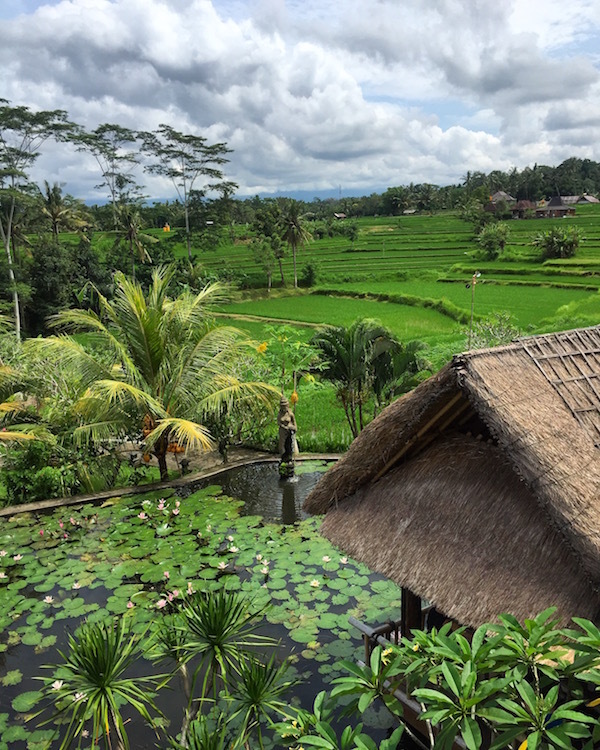 The famed rice paddies and terraces of Ubud are the stuff of fairytales. 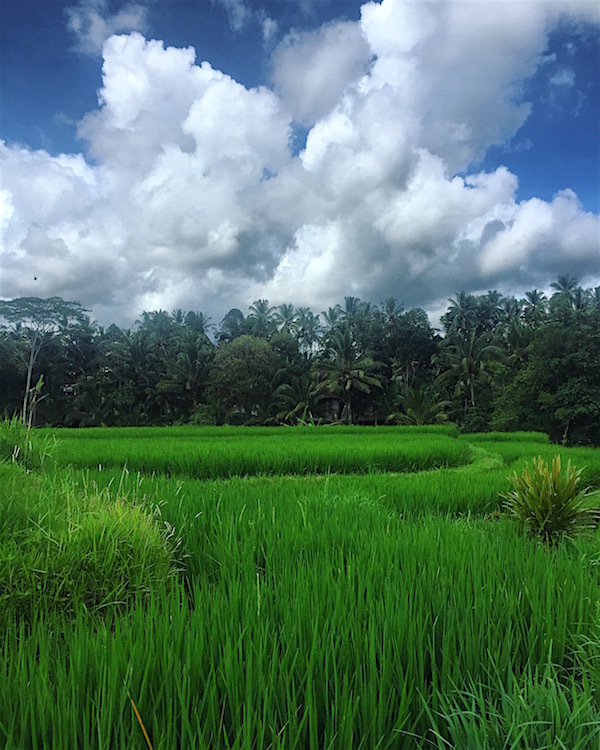 Just driving through Ubud is a visual treat as you pass the greenest hues imaginable and fields bursting with grass, but the rice terraces of Tegalallang are something you should at least drive by even if you don’t actually go inside (they are quite touristy and crowded). Also if you take the time to get lost in the little streets around the outskirts of Ubud you are sure to find secluded rice terraces that you have all to yourselves (like we did). If home decor is your jam, Ubud is heaven for you! It’s world famous for being an artists village, and every second shop is family run and specialises in something specific, from wood carving to metal work to glass. You can find gorgeous handmade furniture, or even smaller curios and showpieces for around the house. In fact in all of Bali, each village specialises in some sort of craft. So depending on what it is you’re looking for, there could be a village thats just right for you. 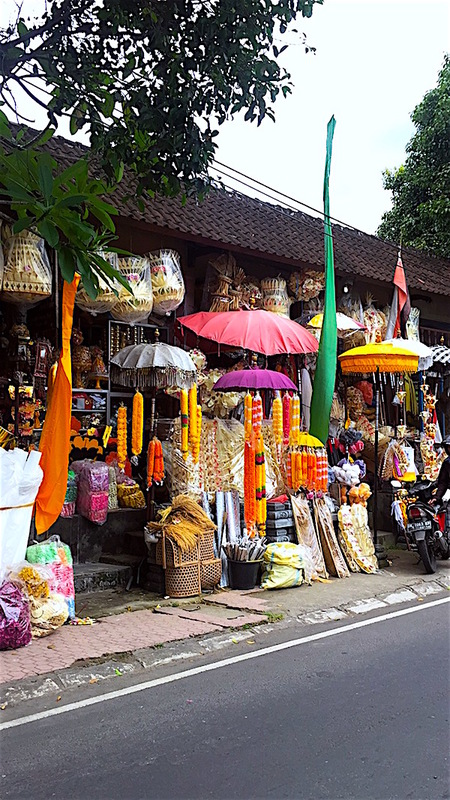 Ubud is a good mix of everything, so if you don’t have a lot of time it’s a great one stop shop. 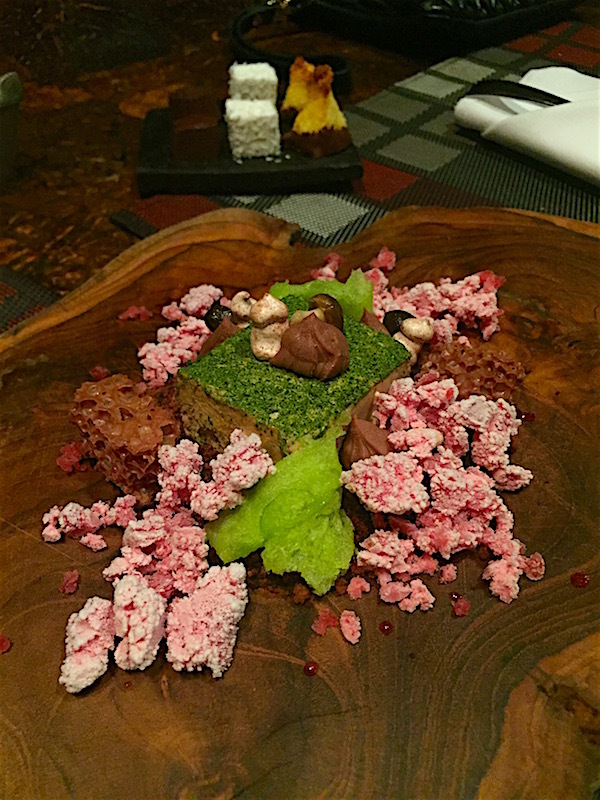 Ubud is where some of the best restaurants are in Bali, and we were spoiled for choice. 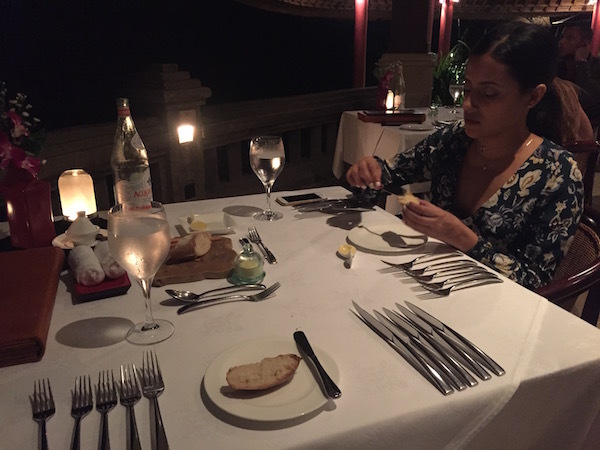 I would recommend at least one expensive meal at one of the many stunning hotels, and try to go for the 6 or 8 course tasting menu. 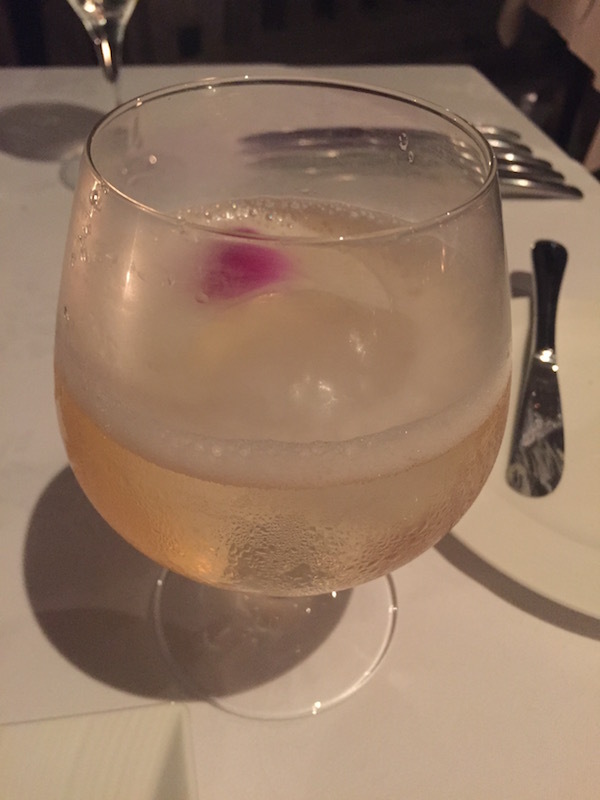 I can personally recommend CasCades at the Viceroy Bali. 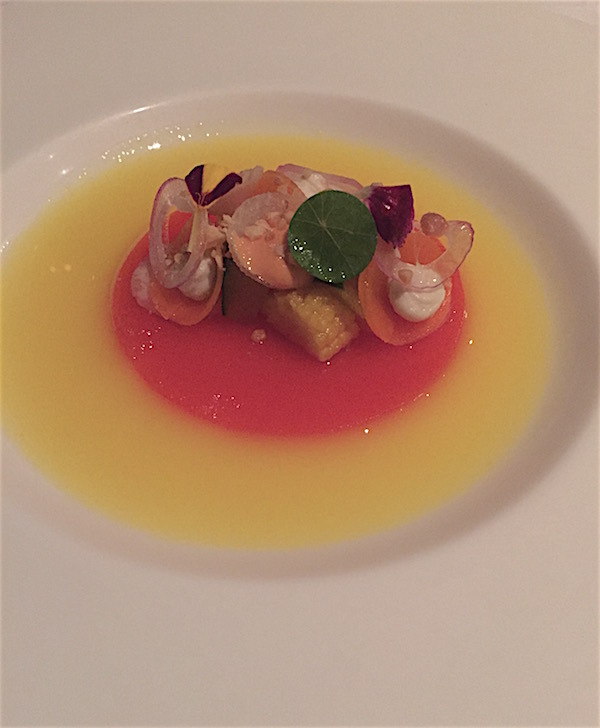 We tried the 8 course degustation menu in both European and Balinese and its was absolutely divine. 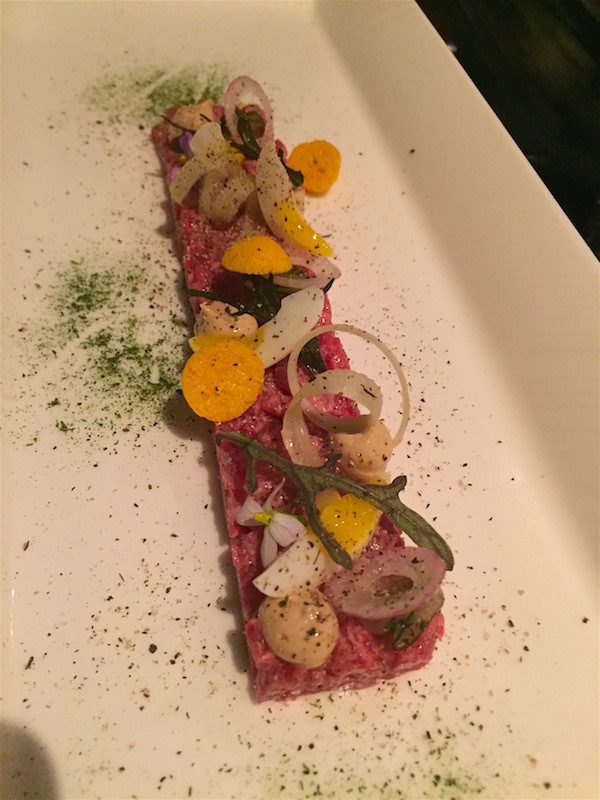 Try to make it while theres still a little light outside as the view of the forest from the restaurant around sunset is not to be missed. 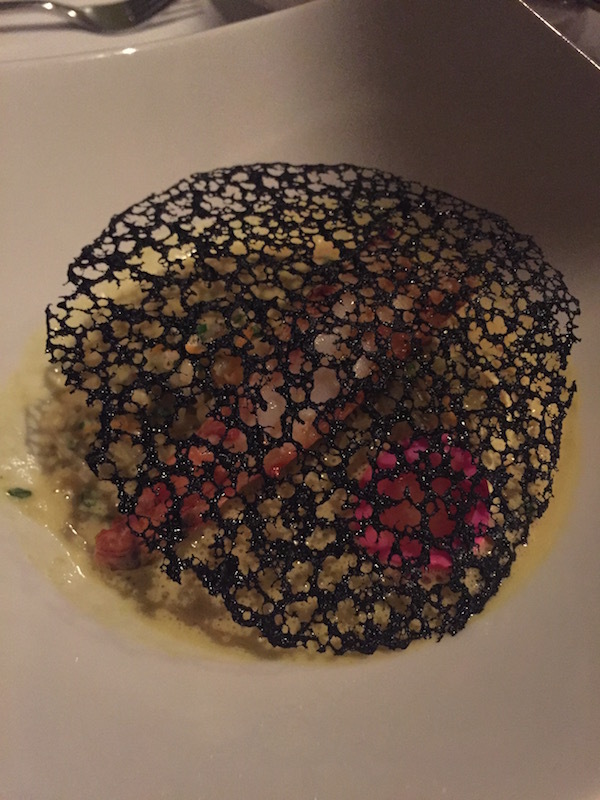 We also ate at Bridges (beautiful location but avoidable) which we thought was lovely but the food and service quality were not up to par for the prices they charge. 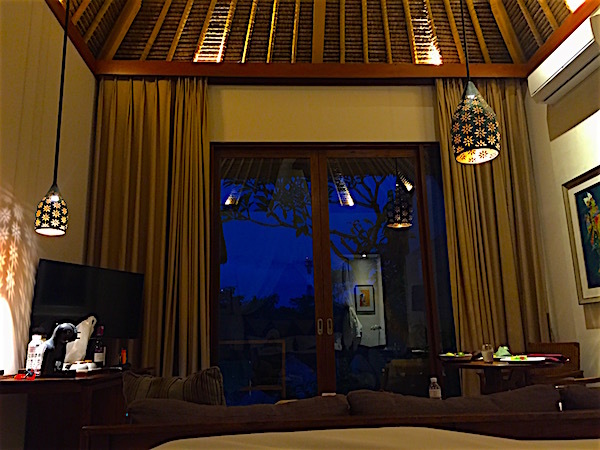 The Alila Ubud however was a truly memorable experience and had impeccable service, staff, ambiance and food. 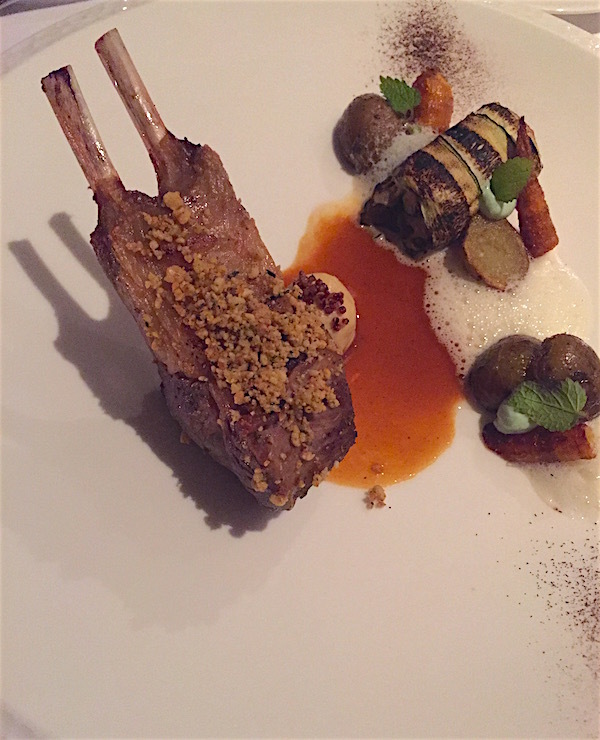 Below are some of the courses we tried at CasCades. Ahhhh the feeling of an ice cold Bintang on a humid Bali day is hard to beat, and add a side of traditional fried duck or roast pork with rice and you have perfection, my friends. 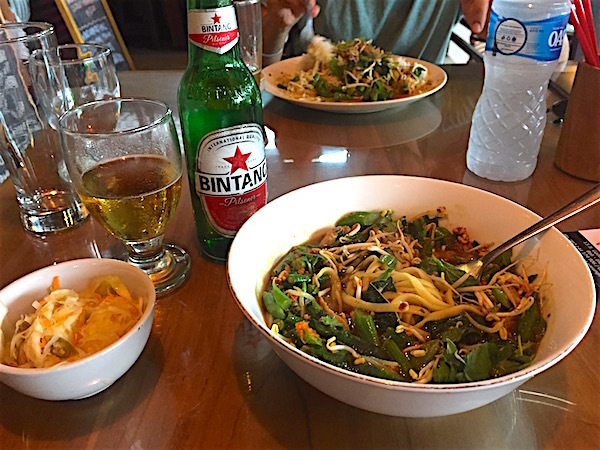 The local warungs are your best bet for meals like this, just settle down into one of the plastic chairs outside a roadside stall, order a large beer and whatever that warung specialises in. 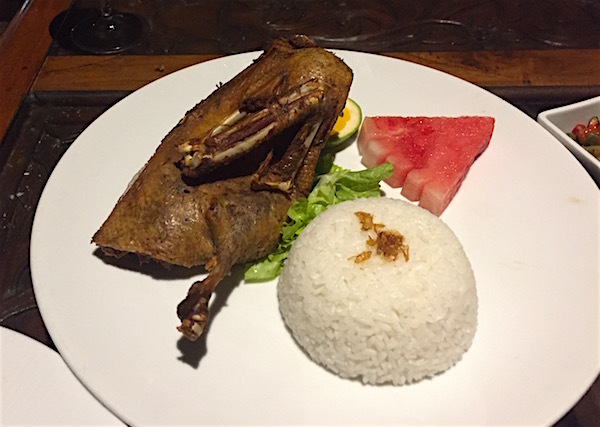 We ate a delicious crispy duck at Bebek Bengil Dirty Duck Diner, served with a side of local sautéed vegetables, pickles and steamed rice. Another dish I love is Soto Ayam, a delicious noodle soup with egg, vegetables, turmeric, chicken or pork, and all the trimmings. It’s considered the food the locals eat when they want to “cure anything”. And of course you can’t miss the classic sate with peanut sauce, mie (noodles) or nasi (rice) goreng, and the famed suckling pig- babi guling. 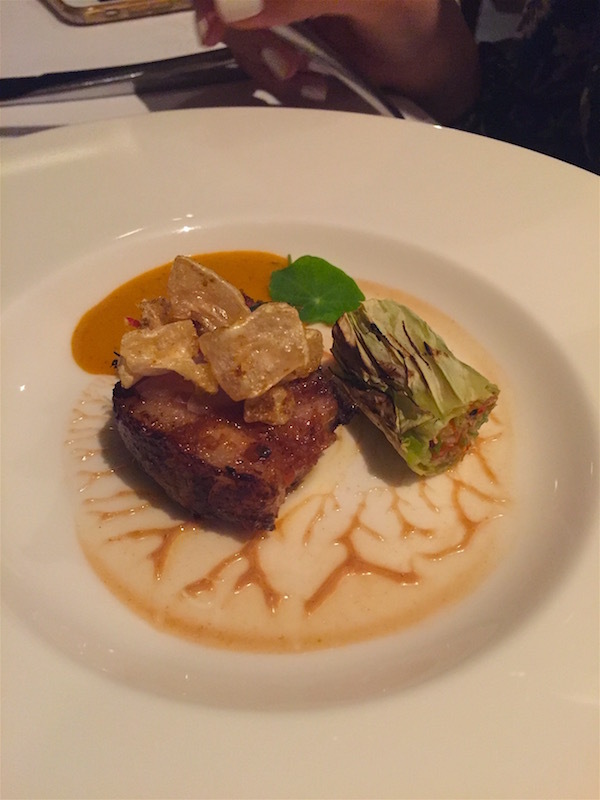 Indonesian cuisine is fresh, vibrant and healthy. 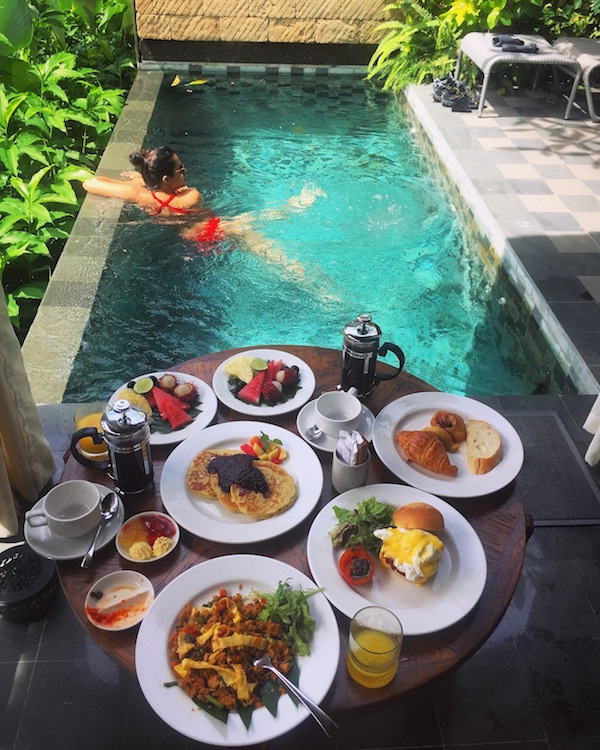 Whether you book an affordable Airbnb or a high end hotel, make sure its got the classic Balinese features- a semi-outdoor living space, a great bathroom, lots of eco-friendly materials and of course, your own private plunge pool. 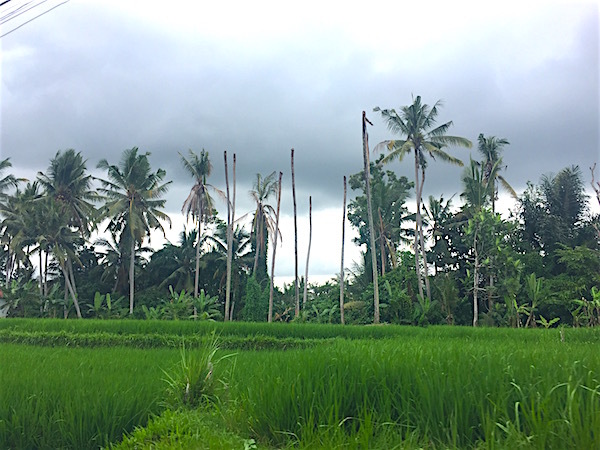 Almost every properties we looked at in Ubud during our research, including both standalone homes for rent and big resorts, all seemed to have these things in common. Especially your own private pool, it’s such a great way to relax after sightseeing and driving around all day in the tropical humidity (plus, skinny dipping at night!). 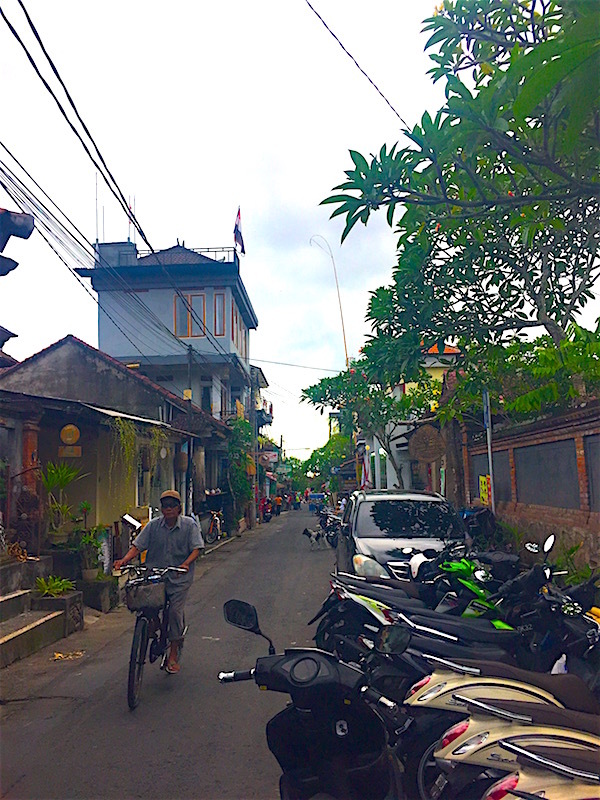 Places in Ubud including bars and restaurants tend to shut early, by 11 or so the town is pretty much dead. Making sure you have accommodation that you love to spend time in will take care of those nights you want to stay up and have a drink, or that one day you decide to just order room service, swim and chill instead of heading out. 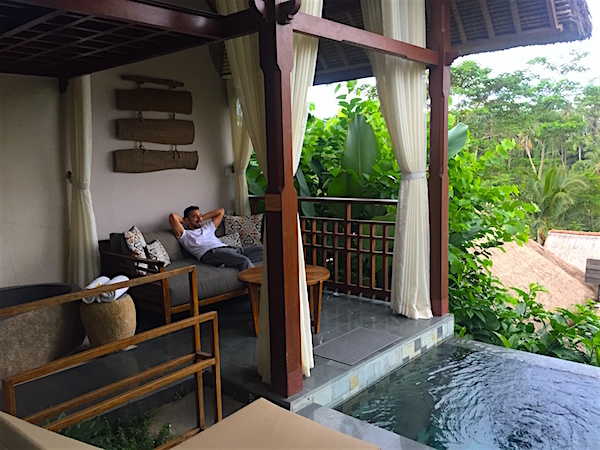 In Ubud there’s a great villa for every budget. 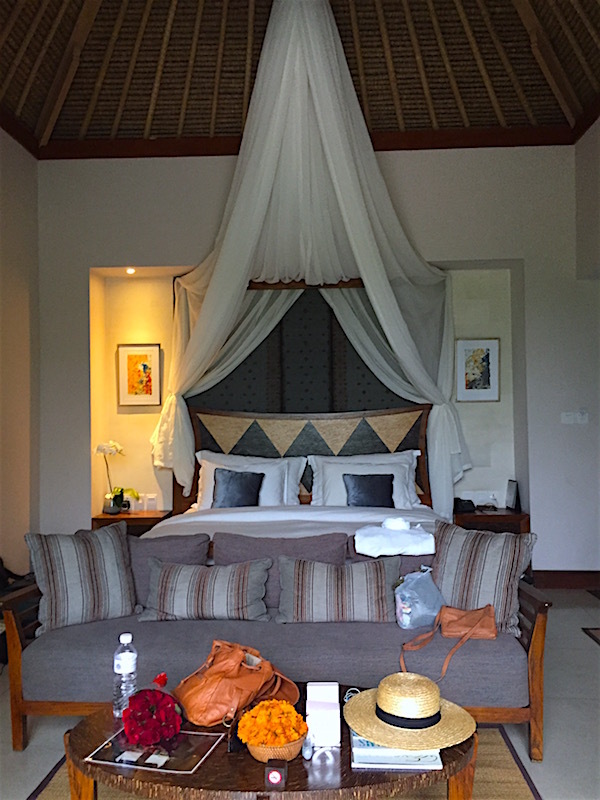 We stayed at Tejaprana Resort & Spa, which I would highly recommend. 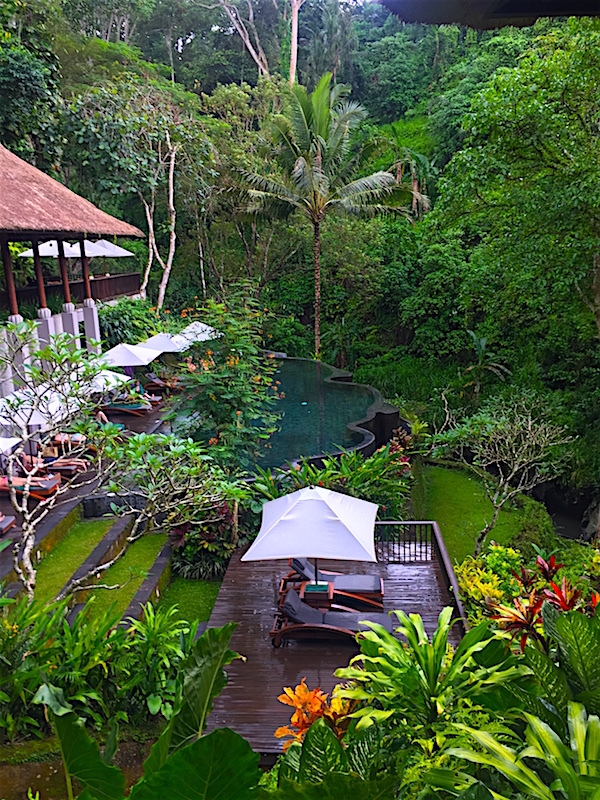 I’m counting the days till I get to go back to magical Ubud and discover more of its many secrets, till I get to wake up to the sounds of birds and the sights of the lush rainforest below, till I get to see the wonderfully warm Balinese people again and shop for unique pieces and eat that delicious food. 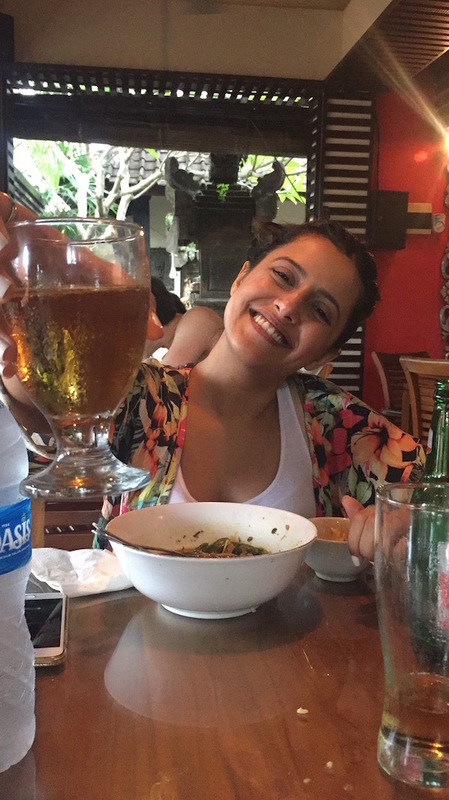 Ubud is a must if you go to Bali, just know that its not the place for crazy nightlife or clubs (stay in Kuta or Seminyak for that). 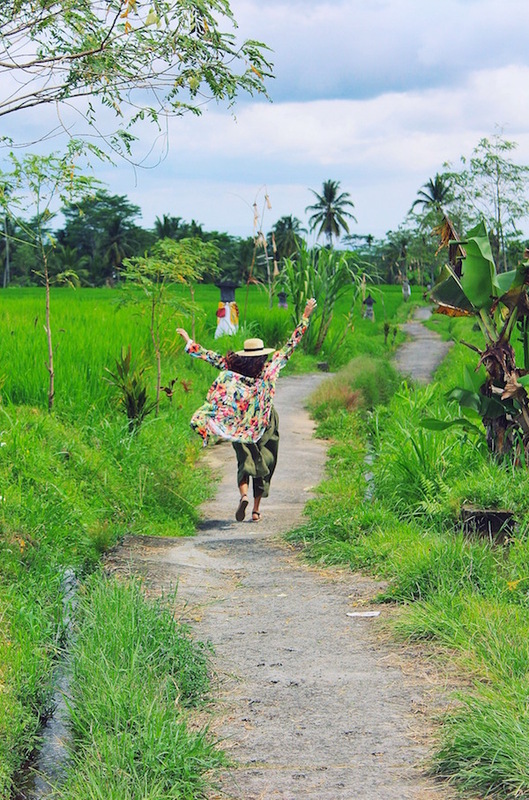 Ubud is for the discerning traveler that wants nature, art, food, culture and peace all in one destination. There are of course so many other things you can do here, such as yoga, cooking classes, hiking or even organic farming, but this is what we managed to accomplish in about 4 days and I think we did pretty well :). 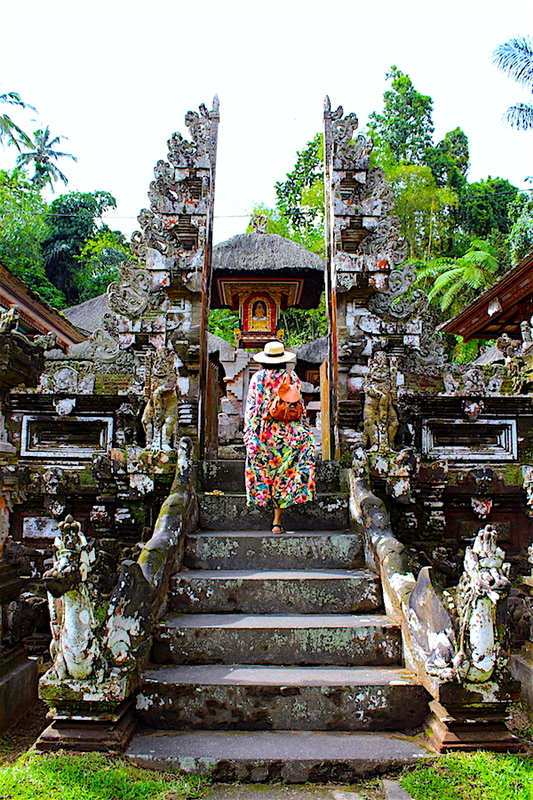 I hope you enjoyed reading my Ubud travel guide, I’ll be back with more travel & style stories very soon!